are created between our animal care specialists and dolphins. His role is to monitor the health of the dolphins that are in our care and provide them with the best welfare living conditions. We design their diets, perform tests and analyses and follow-up on specimens that present some indication of ill health. Expert in animal behavior and training techniques. 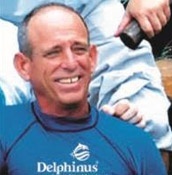 His job is to observe the dolphins, as well as teach and train specialists to establish a relationship of trust between the dolphins and themselves, and find ways to stimulate them continuously. 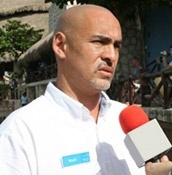 Responsible for supervising the investigations carried out by experts from national and foreign universities in our facilities and on the dolphins that are in our care. 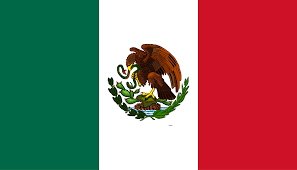 He is also in charge of establishing new agreements with universities and research centers in Mexico and abroad. She manages the educational visits. Our model seeks to create a process for every student and visitor to understand the ecosystem and learn more about marine mammals. 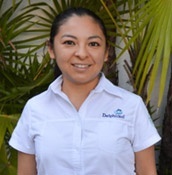 She also supports the Environmental Management System in Delphinus. 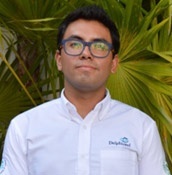 They have studied at prestigious universities in Mexico since Delphinus has collaboration agreements with some of Mexico’s best academic institutions and research centers for marine life. They are part of an elite of animal health professionals given that there are very few places like Delphinus that have the facilities, technology and trained personnel to attend to the animals’ needs 24/7, 365 days a year. Veterinarians and researchers visit us from countries such as Holland, Spain, United States, Colombia, Argentina and Chile because of the prestige we have gained at a national and international level. We give special importance to medical training, during which medical samples are taken from the dolphins for testing: blood, faeces, exudate and gastric content, ultrasound and endoscopic studies. This helps guarantee the dolphin’s integrity without having to handle them in a risky manner.